This article was originally published on 12th June 2012 by the Northumberland Gazette: Visit the Gazette Website. Reprinted with permission. For nearly 20 years, Paul Scott worked with money – but these days he’s putting prophets before profits as the new vicar of a parish church. 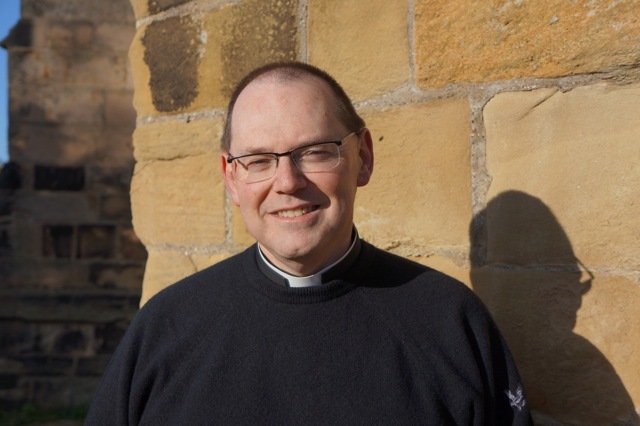 The 55-year-old was welcomed to Alnwick last Tuesday with a special service for his induction at St Michael’s, attended by Martin Wharton, Bishop of Newcastle. Before his calling to the cloth, the 55-year-old served at the heart of local government as an accountant in the borough treasury of North Tyneside Council, before moving on to the NHS, where he was chief accountant for the Northern Regional Health Authority. “Being an accountant was a way of getting some experience of the world,” said Paul, who is originally from Cresswell and attended King Edward VI Grammar School in Morpeth. “But I always knew that being a churchman was what I should be doing. After leaving the health service, Paul trained for ordination in the Church of England and spent three years as a curate at North Shields. He was then appointed vicar of Shiremoor, which he ministered for eight years, before the opportunity to move north arrived. “The previous vicar at St Michael’s retired last summer and I heard the Bishop was looking for somebody new to put in place,” said Paul. “After what seemed like quite a protracted process, I ended up being asked to come here. Paul moved into the vicarage near St Michael’s and is now settling into parish life. But there are some key differences to his old stamping ground, he says. “I’ve just had my first Sunday service in Alnwick and it’s apparent just how much of a tourist attraction the town is,” he said. “Living in my last parish, tourists and visitors were rarely seen and it was very much of a stable community. “In Alnwick, I’ve already met people attending church who are visiting from other parts of the UK, such as Somerset and Cambridge, as well as some from America and Croatia. It’s made things very interesting. Paul also joins the governors of St Michael’s Church of England First School.